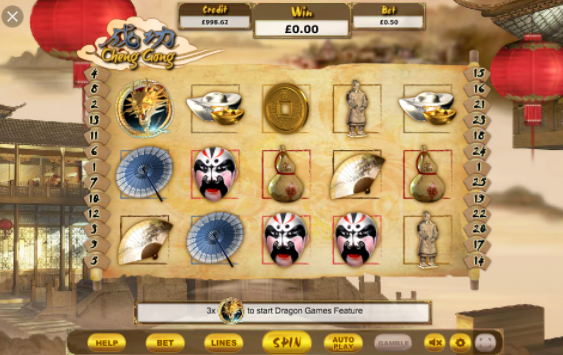 Embark on a mission to ancient China to discover the way of the warrior in this 5 reel 25 payline online slots game. Advance your way through terracotta soldiers, dragons, and ceramic vases as you spin your way through the backdrop of the picturesque Chinese city. Founded in 1997, Eyecon burst onto the scene with the wildly popular game, Gore. The millions of downloads provided their base to begin building an online casino system and gambling games. Their first ever slot, Temple of Isis, released in 2003, remains a firm favourite with online gamers today. Fluffy Favourites, released in 2006 is their most successful game to date and remains one of the best slot games available. If you want to play slot promotions then look no further than Eyecon. 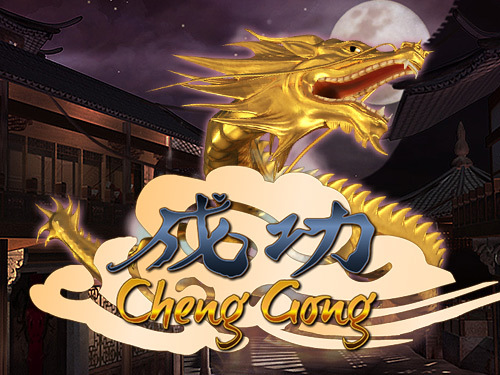 Focusing on the mystical world of ancient China, Cheng Gong is a gorgeous, creative slot from Eyecon. Cheng Gong when translated means Luck and we could all do with a little of that at the slots, right? Set your bets from 0.01 to 0.50 and prepare for a magical trip to the land of the rising sun. The reel panel sits against a background of delicate scenery depicting Chinese architecture. Red lanterns bob overhead adding to a serene scene. The five reels spin on an open parchment scroll. The graphics and design are superb and with a theme inspired soundtrack, you will quickly feel immersed in this beautiful world. There are twenty five bet lines to play and the reels are decorated with theme inspired symbols. Nicely rendered, they represent the many facets of Chinese culture and legend. They include A water pouch, a statuette, gold and silver ingots, a Ming vase, a theatrical mask, a red lantern, a fan and a parasol. These are the line win symbols and the one to watch is the Statue. Line up four and you will get five hundred coins, line up five and you'll snag a whopping two thousand, five hundred! There is a glamorous Princess Wild and she will sub for all other symbols bar the dragon and lantern symbols. A fierce dragon is a scatter - land a dragon scatter on any of the first three reels and this will trigger the Free Spins features. You are given five free spins and the first three reels remain in place (as do any scatters) guaranteeing you a win. Should the Dragon Symbol appear on the remaining reels, four and five, these will also remain in place. The Red Lantern Choice Feature. Land three, four or five red lantern scatters across the reels and you will be rewarded with either five, six or seven choices. Each choice reveals up to six free spins or you can snag a maximum multiplier of three times! The free spins start when this is concluded. The Dancing Princess Prize choice Feature. Land three or more Princess scatters across the reels and you will launch the Princess Prize Choice. Here you will see two fans and you choose just one to reveal your prize. There is a ‘bonus pick' and if you are lucky here, you can earn yourself up to three more choices! And... If after all that fun, you still feel lucky, there is a gamble feature. Should you or shouldn't you? This is a game of ‘double or nothing' and you must choose correctly between a red or blue parasol. You can choose up to five times, each correct choice boosts your winnings. However, choose wrong and it's all over. Beneath the reels, you will find eight golden buttons, each offering you a setting option or game information. Above the reels are three information boxes and you can monitor your credit, your win and your bet setting. This is a delightful, well designed slot. The music underscores your play and it all presents a first class experience. Lovely to look at and beautifully rendered, Cheng Gong is instantly appealing. Without genre limits, this should attract a wide demographic of players that will enjoy the bonus features and line wins. The bet setting is reasonable and both newbies and experienced players will enjoy the gameplay. An equally enticing game is our Tin Town slot.